Dubrovnik Hills - Did you know ? Croatia is located in the heart of Europe, at the Adriatic Sea, which belongs to Mediterranean Sea. Dubrovnik is a world renowned tourist resort most famous for its perfectly preserved medieval stone defensive walls. As the pain and grief faded away, Bosnia and Herzegovina, also known simply as Bosnia, is now fully awakened from the troubles of the past and is ready for full disclosure of its natural beauties. Are you ready for re-discovery ? Bosnia and Herzegovina name comes from the two regions of the country Bosnia and Herzegovina, which have a very vaguely defined border between them. Bosnia occupies the northern areas which are roughly four fifths of the entire country, while Herzegovina occupies the rest in the south part of the country. Bosnia and Herzegovina or simply Bosnia is a European country located in the heart of Europe which adds to the countries touristic slogan: "The heart shaped land". Bosnia is the European story of East meets West and both do blend in perfectly as can be seen is architecture of Sarajevo and Mostar. Since the unfortunate civil war ended in 1995 Bosnia has been waking up and opening its doors to the world which eagerly waited to rejoice once again in the beauty of this lovely country. The capital of Bosnia is Sarajevo which is also the largest city of the country with population of about 300 000 people. The only two other cities are Mostar and Banja Luka. The whole Bosnia has a population of about 4,5 million people. Bosnia is mostly mountainous, encompassing the central Dinaric Alps. The country is almost landlocked by the bordering countries of Croatia, Montenegro, and Serbia, with exception of the town of Neum which lies on the Adriatic Sea with its 26 km (15 miles) of coastline. Climate is mostly continental. The proximity of the Adriatic Sea moderates the climate. However the effect is almost cancelled out by the mountain ranges that cover most of the country. In the Balkan region Bosnia is famous for its cuisine, the special grilled meat called "Cevapi" are a threat for the senses and the tasty oriental pastries called "Pite" come second to no meal. Sarajevo is the place of the reportedly best Cevapi and Pitas. Cevapi are made from minced calf meet with addition of spices while Pitas come in many varieties. Thus there are Pitas from spinach, cheese, potato, or simply minced meat. 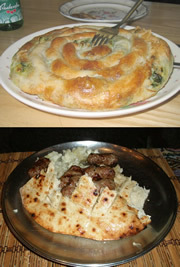 Minced meat Pita is known as "Burek". Many people from Croatia, Montenegro, Serbia and other neighbouring countries take special trips only to be able to enjoy these authentic Bosnian meals. Combine those Bosnian meals with Baklavas and other oriental cakes made in Bosnian fashion you have discovered something new and unforgettable.